We’ve tasted a whole lotta pork dishes and tracked down the best ones served in our city, some of them sticky sweet, some peppery and others on the super-fiery side but all of them are devilishly delicious. Here are LBB’s top 15 picks in no particular order. A regular feature on Indiranagar’s 12th main, this food truck is winning votes with its pork dishes. On top of the list is the Zesty Pork Burger, that comes with a chunky and juicy meat patty that is done on a grill inside the truck. The rest ofthe burger is kept simple with a tangy, spicy mayo and lettuce. Best part? The burger is all yours for a mere INR 150. This dish is standard order for most regulars at this Vietnamese restaurant. Succulent, falling-off-the-bone piggy spare ribs are tossed in a thick, dark sauce that is intense and rich with caramelised, bittersweet flavours. We know you’ll love it too! A slab of juicy pork that has been marinated in whiskey and cooked to perfection on the grill is served with fried pork sausages, a dollop of buttery mash and is accompanied by thick slices of garlicky bread. We suggest you keep your cardiologist on speed dial and dig into this dish with great gusto. Please don’t ruin the experience by getting the sizzler option. The flavours of Coorg have their say with the spare ribs that come out of the kitchens here. The melt-in-the-mouth chunks of meat are coated in the robust, dark spice mix that’s popular in Coorg and to sweeten the deal, they add a bit of honey too. Shredded, slow-braised, and really tender pork piled into a flour tortilla with generous helpings of beans, cheese, spicy salsa, onions, sour cream, jalapenos, and served with cilantro rice. Yes, drool! Sliced pork that has been stir fried with mushrooms, onions and greens in a fiery chilli sauce is served sizzling on a hot plate with a bowl of sticky rice and clear vegetable broth. We recommend, you alternate between mouthfuls of porky goodness with the veggies and the broth rice for the ultimate experience. This dark, divine and intensely flavourful pork curry is cooked the traditional Coorg style with kachampuli, a viscous malty vinegar. The vinegar is responsible for giving this dish its earthy, tangy and tart taste along with a dense black colouring. The Pandi curry is part of this home-style restaurant’s authentic buffet spread. A pile of sliced, sweetened, barbecued pork sits atop vegetables and the sticky rice waits, crisping in anticipation in a hot stone pot. We recommend, you stick in your chopsticks and mix everything together with a dash of sesame oil and pick up bits of sticky and crispy rice, crunchy veggies and delish morsels of the tender pork. 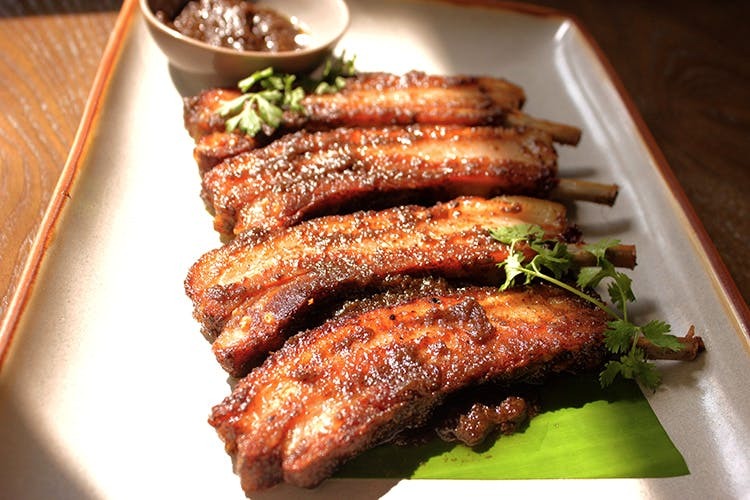 Pork ribs are marinated in a simple paste of minced garlic, ginger and the angry bhoot jolokia chilli, and smoked for days over wood, in this Naga-style dish. The balance of caramelised, juicy chunks of barbecued pork paired with fresh, tart kimchi of green apples, tucked into a perfectly steamed open bao is magic. You’ll be wolfing them down and ordering seconds in no time. This latest addition to Indiranagar’s crowd puller – 12th Main – is a real treat for pork lovers. Their appetiser section includes the mouth-watering Fried Sour Pork – where chunks of fermented meat are first fried to a crisp and then tossed about in slivers of garlic and dry, red chillies. This spiffy restaurant shows plenty of love to the piggy. Their Udon Noodles with house-cured chorizo and Bangalore Black Forest Ham is a hit with patrons. And so is the Pork Belly done in a sharp mustard glaze. But the piece de resistance is the Pork Shoulder that’s roasted into sublime submission for seven long hours. Home cook Maria Fernandes dishes out Goan specialities from her small food delivery service. Aunty Maria swears by her very spicy and pungent slow cooked Pork Vindaloo and so do we.